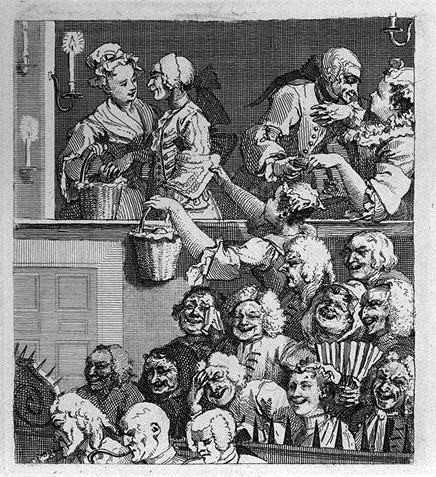 The Laughing Audience is divided into three sections which depict three classes of people. The fops in the top register are portrayed as both more refined and more distant from the dramatic experience than the working class audience in the pit, who seem to be enjoying the performance in an unselfconscious manner. The orange girls, the only 'industrious' characters portrayed in the print, are drawn with the serpentine "Line of Beauty." Round, pleasant faces with long foreheads and delicate noses such as theirs will later be used by Lavater as examples of simplicity, innocence, and moral beauty. The print was used as a subscription ticket for Southwark Fair (1733) and A Rake's Progress (1735). It is signed by Hogarth himself.